Storing food from your garden is a great way to save money and eat healthier all year long! Simply by canning, freezing and drying the foods we grow and love, we have been able to stock our pantry with nearly three-quarters of the food we consume each year. 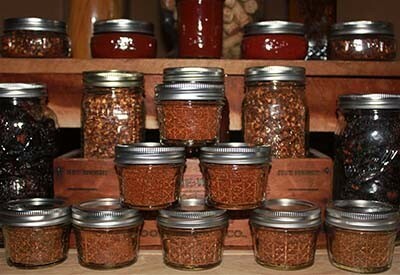 Our homemade hot pepper flakes, and taco and chili seasonings. Drying peppers is easy and delicious! Storing food not only saves big on grocery bills, it also helps eliminate preservatives from our diet. And the taste? Well, it simply can’t be matched by anything processed in a can or package – and purchased from a store! Even if you don’t have a garden, you can still preserve your own stock of fresh food. As harvest season hits full stride, there are bounties of produce available at local farms and farmers markets. It may not be your own, but it is still fresh, local, and usually at a big savings. It’s also a great way for home gardeners to supplement their pantry with foods they might not have the space to grow. For the last several years, we have purchased sweet corn in bulk from a farmer friend who grows the most amazing tasting corn around. It saves a lot of space in our garden, and keeps us from attracting raccoon. We simply can and freeze what we purchase from him for a full-year’s supply. For us, we have found that using a mix of canning, freezing and drying works best. It all starts with creating a goal list for storing food. It is sort of like a shopping list on steroids. To create, we write down what we approximately use in a given month. This includes everything from vegetables, to pasta sauce, salsa, soups, jams and more. Then, we multiply each by 12 to come up with an approximate need for an entire year. When it comes to preserving garden produce, canning is one of the most practical, economical, and space-saving ways of storing food. Freezing is an excellent choice for storing food, especially when it comes to soups, sauces and vegetables. 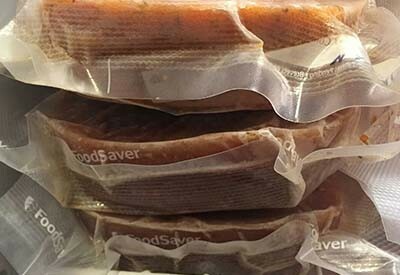 By far, one our best investments ever was our food saver. Our freezer bricks – a great way to store soup or sauce! It lets us safely freeze all kinds of vegetable packets, from corn to green beans, to vegetable stir fry packets made up of onions, peppers, pea pods. They are so convenient to have on hand all year whenever needed. These smaller packets are great when we don’t want to open up one of our canned jars. But when it comes to the freezer, it is our soup and sauce “Frozen Bricks” that are the life-saver. Whenever we make our pasta sauce or homemade soup, we freeze them into what we call bricks. These “bricks” are perfect for quick meals anytime. The soup can be thawed in a pan on the stove, and be ready in about 10 minutes. And they store so easily! We make them by first ladling and cooling in a flat plastic quart container and placing in the freezer. Once frozen, we pop it out, and freeze it with the food saver. When it comes to storing food, nothing quite matches the ease and cost-effectiveness of foods that can be dried. Several of our crops, like our garlic, potatoes and onions, can be dried or stored whole to use nearly all year. Here is to preserving your own great tasting food from your garden this year! Happy Gardening, Harvesting and Preserving! Jim and Mary. If you would like to receive our DIY, Gardening and Recipe articles each week, sign up via email at the very bottom of the post. You can also follow us on Facebook, Twitter or Instagram to receive all of our latest tips and articles. This article may contain affiliate links. Thank you for the suggestion! We will have to check it out! You might enjoy Batch, a cookbook by the team at wellpreserved.ca. It covers all different methods of keeping food, from canning to freezing to smoking and drying. Plus each chapter covers using different parts of a fruit or veg or meat and recipes build on each other. Thank you Clara – the link now goes to the right product. Your link for the Presto Pressure Canner is taking me to the Presto Cooker. Hello, I love your site and have shared it with family members. I have a question regarding the pressure cookers you use. One of my sisters has and Instant Pot and loves it and you have also mentioned how much you like it. I have one sitting in my Amazon shopping cart but have not pulled the trigger as the biggest drawback I see is you cannot can with it. In this article you link to The Presto Pressure cooker. Do you find you use one more than the other? I also love our Food Saver!! Thanks for your wonderful site and advice! what kind of flat plastic quart container do you use to freeze your pasta sauce or homemade soup in?